Whether you choose Bridge View & Riverbank Cottages as a base to explore and enjoy the immediate locality or to visit a wider area, you are really spoilt for choice. As it would be impossible to describe in detail all there is to do and see, the following is a brief taste of what is on offer. To get more information on any of the following, just click on the relevant site on our Links Page. East Clare has been described as "An Anglers Paradise" with over 30 lakes and rivers. The Scarriff (Graney) River is just outside the door of the Cottages. Anglers can catch Bream, Roach, Hybrids, Pike and Trout on our own private stretch. The East Clare Lakes ,Bridget, Kilgory, Doon, Clondanagh to name but a few are all within an eleven mile radius. Lough Derg can be accessed just a mile away with boat hire available. The East Clare Way passes beside the Cottages. A 170km circular walk over the rugged hills of the Slieve Aughty and Slieve Bernagh mountains, through woods and bogs and by lakes and rivers. The route offers shorter loop walks from 5km to 20km. We have leaflets available detailing each of these walks. With such a variety of landscapes, you will certainly enjoy breathtaking scenery. There are many Golf courses in the Shannon Region but the East Clare Golf Club at Bodyke is the nearest to the Cottages, just 5km away. An 18 hole parkland course in a peaceful rural setting. Pitch and Putt is also available near Mountshannon. 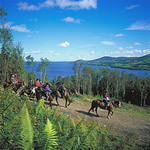 A journey of 30 minutes will bring you to Clonlara Equestrian Centre. Here they cater for all levels of experience from the novice to the experienced. The University of Limerick Activity Centre offers a variety of courses at the Two Mile Gate, Ballycuggeran, Killaloe. 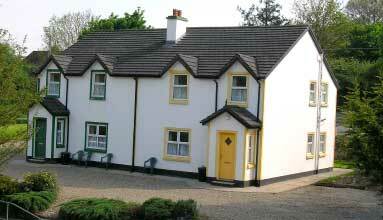 Located on Lough Derg on the Scarriff road. In Mountshannon, you can enjoy different watersports at the Lakeside Holiday Park. Boat Trips on Lough Derg can be booked in Mountshannon. A trip with guided tour of Holy Island (Inis Cealtra) is offered by the East Clare Heritage Centre. The Spirit of Killaloe is a 50 seater cruise boat which operates out of Killaloe. Pallas Karting is Europes largest karting centre with two tracks, a 500m for the beginner and 1500m for the more experienced. They can be found in Tynagh outside Portumna. Art at The Park offer painting and drawing classes in a beautiful location in Killanena overlooking Lough Graney. Julie Douglas is your teacher. The local area is rich in history, heritage and folklore. In Tuamgraney, St.Cronan's 10th century church is home to the East Clare Heritage Centre. This building has the distinction of being the oldest church still in use in Ireland and Britain. Holy Island (Inis Cealtra) on Lough Derg was a 6th century monastic settlement. Today you can see a well preserved round tower and the ruins of six churches. The guided tour of Holy Island is well recommended. Killaloe was the birth place of Brian Boru, once high king of Ireland. The Killaloe Heritage Centre tells the story of the arrival of Christianity to Monastic times and the development of the River Shannon as a transport system. The 13th century Romanesque doorway, the Kilfenora Cross – a 12th century high cross and the stone carving with Ogham and Runic writing can be seen in St.Flannans Cathedral in Killaloe. 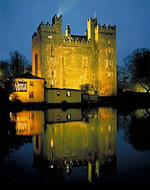 The Shannon Heritage web site gives information on Bunratty Castle and Folkpark, KnappogueCastle and Walled Garden, Craggaunowen, and King John's Castle. These attractions are all within easy driving distance of the Cottages. 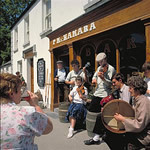 East Clare is renowned for Traditional Music and is home to many well know musicians. You will find music sessions in a variety of pubs locally. 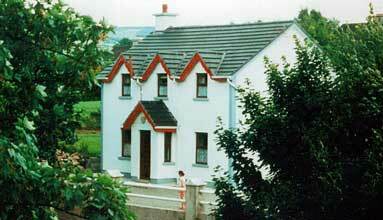 Feakle, which is 9km from us, has traditional session midweek on Wednesdays and Thursdays. The Feakle International Festival is held in August and details can be had from their web site. We are surrounded by scenic beauty in East Clare. The hills of Slieve Bearnagh and Slieve Aughty roll down to Lough Derg and look across to the Arra Mountains in Tipperary. The drive from Scarriff to Killaloe is spectacular and if you choose to go walking higher up in the hills the view only gets better. An hours drive brings you to the Burren. This barren limestone covered landscape known as "karst topography" is home to rare flora. Near Ballyvaughan, you find the Ailwee Caves which are well worth a visit. The view over Galway Bay and the Aran Islands is one of my favourites. In the village of Doolin a ferry service brings visitors to the Aran Islands. 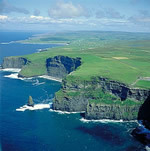 Travelling on, the next treat in store is the magnificent Cliffs of Moher. The Cliffs stand 214 meters high and overlook the Atlantic for 8km. Lahinch is next with its beautiful safe beach and you also have an aquarium to visit. Bunratty Castle and Folkpark is about 45 minutes away and is another of my favourite places to visit. The castle is in wonderful condition and both itself and the folkpark are very interesting for adults and educational for kids. This trip could also include a visit to our county town of Ennis. With its narrow streets and friendly people you will not be disappointed. Dolphin watch in Carrigaholt, West Clare is another place of interest. Just over an hour will get you to Galway City and if you choose to go further on you can visit Connemara. North Kerry can be accessed either by road via Limerick city or by ferry from Killimer in West Clare across the Shannon Estuary to Tarbert in Kerry. You might be lucky to see some dolphins from the boat. Offaly, another neighbouring county is famous for its peatlands. The Bog Train Tour on the Clonmacnoise and West Offaly Railway is a very enjoyable and educational experience. On this 9km trip over the Blackwater Bog near Shannonbridge you will learn the history of the bog, hear stories of archaeological finds and get a chance to cut some turf.